Italians take much pride in their wide array of cured meats. Ancient Romans made original versions of the Lucaniche and Prosciutti, which are still specially made today. 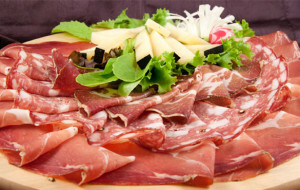 Pork is easily the favorite meat used for curing in Italy, although some specialty productions produce cured meats ranging from goose and beef to wild boar and venison. Spiciness of the meat has regional variations. Southern Italian salumi are more heavily influenced with black pepper, red pepper, and chili flakes, making them much spicier than northern Italian versions. 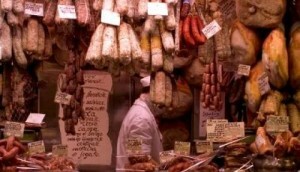 Simply visit an Italian salumeria to gain perspective on the grand scale of unique local and national cured meats. Is not a term often heard outside of Italy, yet many of these products are found in specialty shops or Italian delicatessens and are used by cooks all over the world. Some, like prosciutto, need no introduction while others are not usually seen outside their motherland. Salumi are a large family of high-quality cured meats that go beyond Italy’s famous hams, lending their flavors to terrific appetizers as well as main courses. Salumi are often confused with another Italian meat product known as salame. Salumi are the product family that includes salame. Salame is a term describing a sausage made from ground pork and spices, which is then encased and often cured. Salumi are also made of pork (usually), but often denote products which have been preserved in salt (and spices) and not encased before aging. There are, so, examples of salumi that do use a natural casing, therefore all salami are salumi, but not all salumi are salame. Salumi tend to be tightly linked to their area of production, to the point of becoming true symbols: think of mortadella and Bologna, or prosciutto and Parma. For this reason, salumi are often protected by a DOP or IGP designation. Bresaola – This is thinly sliced beef with a very deep red color. Bresaola is sweet and aromatic. This salumi is coated with olive oil and Parmigiano cheese. Capocolla – From the Campania region, Capocolla is slow-roasted pork surrounded by spicy red pepper. Coppa – This is a fully air-dried, thinly cut pork shoulder or neck. Coppa is native to Italy’s Emilia Romagna region. Dry Cured Hot Coppa – Native to the Emilia Romagna region of Italy, this thinly sliced cured pork is very similar to prosciutto. It is a spicy, air-dried variation of the original Coppa. Pancetta – This salt-cured pork belly is seasoned with nutmeg, pepper, fennel, dried ground hot peppers, and garlic. It is served thinly sliced or chopped after a three month drying process. Prosciutto – A master Salumiere hand-trims and inspects each Prosciutto ham. An intensive curing process includes rubbing and salting by hand, followed by long periods of air-drying. This sweet meat is served sliced or diced. Rotola – Mozzarella, prosciutto, fresh basil, sun-dried tomato and hot salami are spun into a small wheel to create this uniquely Italian delicacy. Salami – An Italian tradition of many variations. Salami is commonly flavored with garlic, peppercorns, paprika, fennel and wine. Salami variations include Finocchiona, Pepperoni, Fegatelli, Felino, Genoese, and Milanese. Each is uniquely flavorful. Wine Salami – Dry-cured salami infused with the finest Italian wines. Like other salami, this is made from fresh pork with no additives. Crusty bread and soft cheeses are the perfect match. Agnello di Sardegna IGP – Sardinian lamb fed only from sheep’s milk are the source of this classic cured-meat. Sardinia is known for its sunny, wind-swept, openness where lambs are raised, contributing to the gamey flavor and high quality. This nutritional meat is tender, lean and white. Bresaola della Valtellina IGP – Written documents from the Valtellina district regarding the curing of meats date back to the year 1400. This historic region gives its name to this delicacy consisting of naturally aged, raw beef. Bresaola della Valtellina is known for its delicate texture. Capocollo di Calabria DOP – Written Calabrian documents describing methods used to cure pork date back to the 17th century. Calabrian hogs provide the meat, which is aged for thirty to one hundred days. Local plants provide the extra spices and extracts that go into making Capocollo di Calabria. Cumin, black pepper, red pepper and chili peppers are common additions. The entire region of Calabria claims this meat and its production zone. Coppa Piacentina DOP – Rural traditions of people from the Po Valley have influenced the evolution of this cured meat, which dates back to Roman times. This type of salami is made from raw, salted, naturally aged pork. The interior of this cylindrical meat is red with pinkish-white spots dispersed throughout. The province of Piacenza and its special climate imbue the pork with unique qualities. Note: Coppa Piacentina can only be produced in the province of Piacenza, below an altitude of 900 meters. Cotechino di Modena IGP – Doctor and physician Marco Cesare Nannini wrote about Cotechino di Modena, which first appeared in the Italian town of Mirandola in the early 16th century. The townspeople began taking innovative measures with their food when the town was invaded by Pope Julius II. Cotechino di Modena is a sausage blended with striated muscle fibers, pork fat, pigskin and various seasonings. The provinces of Modena, Ferrara, Ravenna, Rimini, Forlì, Bologna, Reggio Emilia, Parma, Piacenza, Cremona, Lodi, Pavia, Milan, Varese, Como, Lecco, Bergamo, Brescia, Mantua, Verona and Rovigo all claim the production zone for this meat. Culatello di Zibello DOP – This salted, eleven month-aged ham comes from the leg of an adult hog. The red meat is peppered with specks of white fat. Although Culatello di Zibello has an extremely strong aroma, its flavor is rather sweet and delicate. The climate of the surrounding area of the Po River plays a vital role in the meats final characteristics. The area is known to be rather hot and moist, which gradually affects the meat while it ages. Lardo di Colonnata IGP – This is lard, from the village of Colonnata, was named after a group of slaves was brought to the area by Romans to work the marble quarries. The lard is actually both cured and aged in marble tubs. Whenever work at the marble quarries came to a halt in the Middle-Ages, people from the area persevered due to their skill in breeding pigs and working with their meat. The town still holds an annual lard festival, which falls on the day of Saint Bartholomew (patron of butchers). Lardo di Colonnata is placed within marble tubs within sebety-two hours of being trimmed. Layered with the lard are seasonings such as sea salt, ground black pepper, fresh rosemary, and roughly minced garlic. Lardo di Colonnata is aged for six months. Mortadella Bologna IGP – This sausage, from the city of Bologna, dates back to the 16th century. This oval or cylindrically shaped meat has a smooth, inelastic texture and is pink in color. At least 15 percent of each slice is composed of white squares of evenly distributed animal fat. Mortadella Bologna is known for its smoke-free aroma and flavor. Emilia Romagna, Piedmont, Lombardy, Veneto, Tuscany, the Marches, Latium, and the province of Trento share the production zone for Mortadella Bologna. Pancetta di Calabria DOP – Written Calabrian documents describing methods used to cure pork date back to the 17th century. Calabrian hogs provide the meat, which is aged for thirty to one hundred days. Local plants provide the extra spices and extracts that go into making Capocollo di Calabria. Cumin, black pepper, red pepper and chili peppers are common additions. The entire region of Calabria claims this meat and its production zone. Pancetta Piacentina DOP – This salt-cured, aged, uncooked meat has been renowned since the 14th century for its pleasant aroma and savory flavor. The meat itself is bright red and peppered with spots of white fat. Its gradual aging process leaves Pancetta Piacentina soft and sweet. Note: Pancetta Piacentina comes in 5 to 8 kilo cylinders. Prosciutto di Carpegna DOP – Carpegna was once a village in the Roman municipality of Pitinum Pisaurense. This cured ham, named after the village, is salted and naturally aged. The pink meat has a unique, sweet, and fragrant scent. Carpegna is delicate in flavor. The outside of this ham is covered in a small amount of fat. Prosciutto di Modena DOP – Man acquired the skills of animal rearing and meat curing during the Bronze Age; Prosciutto di Modena dates back to this time. This pear-shaped meat has a bright red interior. The flavor is not salty, but distinctly sweet. The provinces of Modena, Bologna and Reggio Emilia share the production zone for Prosciutto di Modena. Prosciutto di Norcia IGP – The Norcia area does not have ideal conditions for agriculture. Historically, the people of Norcia tended to focus on raising animals instead of growing crops. This naturally aged, salted meat comes from the rump of mature hogs. It is known for its savory aroma and flavor, without being overwhelmingly salty. The color of Prosciutto di Norcia ranges from pink to red. The Valnerina district is home to the production zone for this meat, as long as the land is 500 meters above sea level. Prosciutto di Parma DOP – This 2000 year-old Italian masterpiece is treasured worldwide. Only salt is used in treating the prime, raw hog meat. The typical aging process for Prosciutto di Parma takes at least ten to twelve months. Prosciutto di Parma is protected by the Consorzio del Prosciutto di Parma; an authentic product can be identified by the mark of a ducal crown. Prosciutto di San Daniele DOP – The Patriarch and Bishop-Count of the Patriarchy of Aquileia demanded taxes for the town of San Daniele be paid in ham. The origins of Prosciutto di San Daniele date back to these Middle-Age times, but its mass production did not begin until the 17th century. This guitar-shaped meat is aged, uncooked, and reddish-pink in color. The twelve to thirteen month sea-salt treatment process gives the meat a sweet, delicate flavor with an unmistakable aroma. San Daniele del Friuli, in the province of Udine, is the production zone. Note: The retention of the hog’s leg is a defining characteristic of Prosciutto di San Daniele. Prosciutto Toscano DOP – This raw, aged ham is exclusively produced in Tuscany. Production regulations influence the breeding and raising of livestock, and the aging, treatment, and final properties of the meat itself. The round, red meat is typically between 8 and 9 kilos in weight when finished. Prosciutto Toscano has a delicate, savory flavor with a remarkably fragrant aroma. Prosciutto Veneto Berico-Euganeo DOP – The color of this meat from the Veneto region ranges from pink to red. Only select adult hogs are used in producing Prosciutto Veneto Berico-Euganeo. After salting and aging, the flavor and aroma of this meat are both delicate and sweet. Salame Brianza DOP – Pork butchering was developed and improved in the Lombardy region because of the medicinal and therapeutic needs of the monastic orders. This cylindrical salami is one of the most common throughout Italy. The ruby red meat comes with a distinct aroma and remarkably sweet flavor. The production zone is shared by the provinces of Lecco, Como and Milan. Salami di Varzi DOP – This salami originated during the Lombard invasions. Only select pork is used to make the meat, which became very popular as far back as the 12th century. The pork is minced, and then stuffed into an entrail casing. A finished Salami di Varzi is bright red in color with pure- white fat distributed evenly throughout. The length of aging can influence the distinctive aroma and sweet taste. Certain towns in the province of Pavia own the production zone for Salami di Varzi. Note: Each uniquely weighted and aged sausage has its own name; Filzetta (weight from 0.5 to 0.7 kilos, minimum aging forty-five days); Filzettone (from 0.7 to 1 kilo, minimum ageing sixty days); Sottocrespone a budello semplice (from 1 to 2 kilos, minimum ageing 120 days); Cucito a budello doppio (from 1 to 2 kilos and more, minimum ageing 180 days). Salame d’Oca di Mortasa IGP – The Po, Ticino, and Sesia rivers encompass an area perfect for goose farming because of its fresh herbs and water. The historic center of this area, known as Lomellina, is the town of Mortara. This meat, named after the historic town, is believed to have been produced to satisfy the kosher needs of the local Jewish community. In 1891, Pellegrino Artusi documented a sausage made with a mixture of goose and pork meat when there was a shortage of geese. Salame Piacentino DOP – In the early 18th century, Salame Piacentino was commonly served to royalty. Fifteen to twenty percent pig fat is added to the very lean pork meat used to produce Salame Piacentino. The aroma of this bright red meat is uniquely intense. Cutting into the one- to two-pound cylindrical meat will reveal small specks of white fat. Salamini Italiani alla Cacciatora DOP – This small, cured pork meat took its name because it has always been a staple of the hunter’s diet. It is ideal to pack for long migrations because it is small and well preserved. Law states that this meat be no more than 2.4 inches in diameter and 8 inches in length, with a maximum weight of 11.6 oz. Ten regions share the production zone for Salamini Italiani alla Cacciatora: Lombardy, Piedmont, Friuli Venezia Giulia, Emilia-Romagna, Veneto, Marches, Tuscany, Umbria, Abruzzi, Latium, and Molise. Salsiccia di Calabria DOP – Written Calabrian documents describing methods used to cure pork date back to the 17th century. Calabrian hogs provide the meat, which is aged for thirty to one hundred days. Local plants provide the extra spices and extracts that go into making Salsiccia di Calabria. Cumin, black pepper, red pepper, and chili peppers are common additions. The entire region of Calabria claims this meat and its production zone. Soppressata di Calabria DOP – Written Calabrian documents describing methods used to cure pork date back to the 17th century. Calabrian hogs provide the meat, which is aged for thirty to one hundred days. Local plants provide the extra spices and extracts that go into making Soppressata di Calabria. Cumin, black pepper, red pepper, and chili peppers are common additions. The entire region of Calabria claims this meat and its production zone. Sopressa Vicentina DOP – This aged, uncooked, pork salami is known to be very compact and tender. A finished product comes in a cylinder covered in a naturally formed, light patina. Herbs and spices are noticeable in the aroma of the opaque, medium/large grained slices. The delicate flavor is accented with pepper and garlic, but it remains sweet overall. This meat is produced by farmers in the territory of Vicenza, using only traditional methods. Speck dell’Alto Adige IGP – An aged, salted, seasoned, and cold smoked ham is used to produce this relative of bacon, which originated in the 1300s. Speck dell’Alto Adige has a brown exterior and a red interior with areas of whitish-pink. Its unique flavor is influenced by seasonings such as juniper berry, pimento, black pepper, and garlic. Speck dell’Alto Adige is known for its strong, pronounced aroma. The province of Bozano can claim the production zone of this meat. Valle d’Aosta Jambon de Bosses DOP – This cherished product of the Saint-Rhemy-en-Bosses region dates back to at least 1397, the year of its earliest documentation. The 7 -kilo finished product is salted, naturally aged, and uncooked. An outer coating of hard, shiny fat covers the red interior of Valle d’Aosta Jambon de Bosses. The flavor of this cured meat can be described as somewhat gamey, with salty and sweet accents. The mountain climate of the Saint-Rhemy-en-Bosses region has an influence on the flavor variations of the ham. Valle d’Aosta Lard d’Arnad DOP – This specifically produced and aged pork lard has been made in the Valle d’Aosta region for over two centuries. A white outer layer, streaked with meat, covers the pinkish-white lard interior. The artisans who make Valle d’Aosta Lard d’Arnad take much pride in their traditional methods, and the quality of their product reflects this sense of dedication to detail. This lard is produced exclusively in the town of Arnad within the Valle d’Aosta. Vitellone Bianco dell’Appennino Centrale IGP – This meat comes from one- to two- year- old calves of the Val di Chiana, Marchigiana and Romagnola breeds. The genetics of each cattle, along with breeding and feeding methods, imbue this meat with distinct qualities. It is specifically known for its high organoleptic and nutritional values. 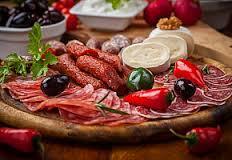 The meat itself is white and produced in all areas surrounding the central Appenine Mountains. Zampone di Modena IGP – Doctor and physician Marco Cesare Nannini wrote about Zampone di Modena, which first appeared in the town of Mirandola in the early 16th century. Zampone di Modena is a sausage blended with striated muscle fibers, pork fat, pigskin and various seasonings. A natural casing from the animal is used to contain this meat. 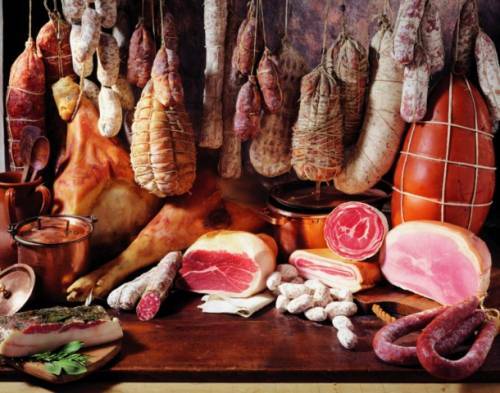 The provinces of Modena, Ferrara, Ravenna, Rimini, Forlì, Bologna, Reggio Emilia, Parma, Piacenza, Cremona, Lodi, Pavia, Milan, Varese, Como, Lecco, Bergamo, Brescia, Mantua, Verona and Rovigo all claim the production zone for this meat.